Looking for a gift for that person who has everything? Look no further. Buckeye Designs and Engraving specializes in unique gifts. With inspiration from Uncle Wayne Barker’s experience in graphic design, Ben Barker used his project management skills to open Buckeye Designs and Engraving. Together they produce everything from personalized wine glasses for weddings to engraved watermelons for summer fairs. One of the most common requests they do is the personalization of people’s guns but they thrive on trying new ideas. They believe that the sky is the limit! 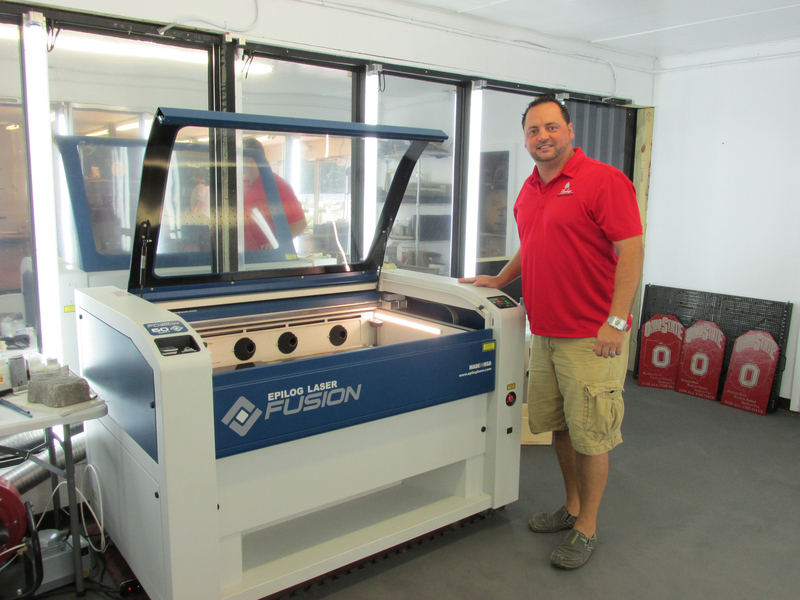 Buckeye Designs and Engraving uses advanced laser engraving technology to create personalized gifts and other items. Owner Ben Barker shows off the technology they use. Using advanced laser engraving technology, Buckeye Designs and Engraving is able to create one of a kind personalized gifts for all occasions. Their American made Epilog Laser system is able to etch intricate designs into wood, acrylic, plastic, marble, and much more. Attached to a computer just like a printer, the system will cut designs created in graphic design software into the medium of your choice using a CO2 laser beam. 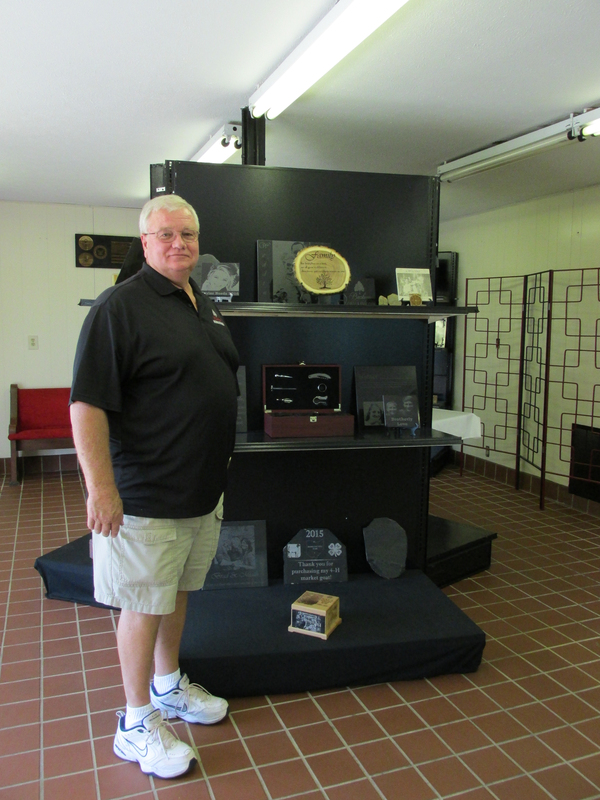 Wayne Barker poses with a display of items in the showroom. Family photos etched into marble, granite or wood make fantastic gifts. Wood plaques imprinted with sports teams can be displayed to show team spirit and custom pet tags can help guide your pets home should they roam off. Priding themselves on competitive pricing, this veteran owned and operated business also completes more standard business requests like nametags, nameplates and awards. So they really are a one-stop shop! You can visit the showroom at 486 South Paint Street in Chillicothe to see a variety of their work. Hours of operation are Monday through Friday 10 a.m. -7 p.m. and weekends by appointment. Find them on Facebook Here or call 740.851.3851. Family tree engraved on wood. Transforming family photos into cherished keepsakes. A watermelon for the Ross County Fair! This entry was posted in Community and tagged Buckeye Designs and Engraving, Chillicothe Ohio, Ross County Banking Center, VCNB Financial Family by vcnbfamily. Bookmark the permalink.